Ecommerce and logistics are two of the fastest growing industries. 2-day shipping from companies like Amazon, Walmart and other online retailers has become an expectation. The last time you ordered something online and it didn’t offer quick or free shipping didn’t it annoy you? For these companies to continue providing quick shipping and low prices, they need warehouses and footprints all across the country. This is where sites like LogistiCenter come in. 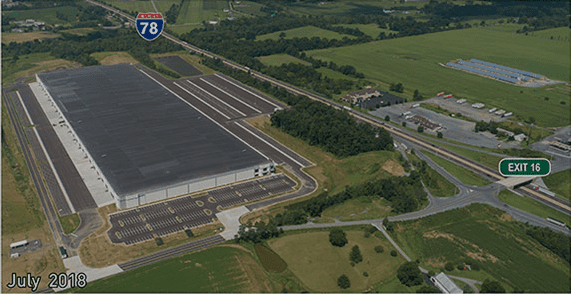 LogistiCenter at Midway, 270 Midway Road in Bethel Township, Berks County, PA, this building is strategically located along the I-78 corridor. It is connected to I-81, I-476 and I-76 (Pennsylvania’s Turnpike). These connections are essential corridors for trucking. They help access over 35% of the United States’ and 60% of Canada’s population in a one-day truck drive. The Greater Reading community is within a one day drive of over 150 million people. This locational advantage is why our I-78 corridor is one of the fastest growing logistics hubs in the United States. The 1 million square foot LogistiCenter at Midway in Bethel, PA.
And have we mentioned our workforce, well that’s ready too! With a commitment to developing a workforce pipeline, our technical schools and training centers are producing qualified and work-ready candidates. Greater Reading welcomes you to your next business location! Dock Doors: 212 dock doors. 108 are equipped with 35,000 lb. mechanical levelers.